The Old Mt. Zion Church at ACRI has been fully restored to its former glory. The light filtering through the stained glass windows casts a brillant glow on the majestic pine and heart pine pews. 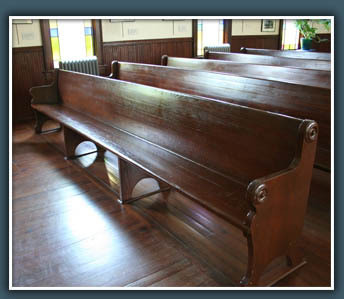 The Legacy Pew campaign provides an opportunity to have a plaque placed on one of these beautiful pews in return for your generous gift of $5,000. Thousands of visitors each year will view your sponsored pew. The Legacy Pew plaques are available to commemorate a special person (in honor or memory), organization, freedom slogan, and other treasured remembrances. A commemorative 2”x4” Legacy Pew Plaque, placed on one of the beautifully restored pews in the Old Mt. Zion Church. An engraving for the plaque, honoring the donor or a person or organization of the donor’s choice. 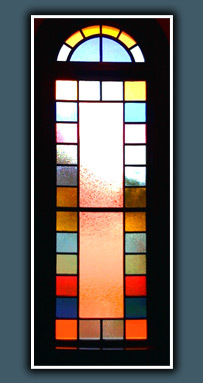 A commemorative 4”x6” Legacy Stained Glass Window plaque, placed at eye level beside one of the bright stained glass windows of Old Mt. Zion Church. All contributions are tax deductible to the extent allowed by law. The Albany Civil Rights Institute is an organization qualified to receive tax-deductible gifts under IRS code section 501(c)(3).